I was inspired by one of the projects in Irina Miech's wonderful new book, Beautiful Wire Jewelry for Beaders 2 , to make this pendant bail. It's not exactly the way Irina did it...I don't like making exact copies most of the time, but I want to acknowledge that the idea of using the two filigree pieces came from her. She used two pieces that actually fit *into* the hole, so her method of joining them is quite different from mine. 1. 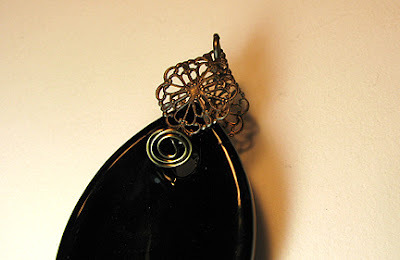 Curve the filigree pieces gently with your fingers to match the curve at the top of the pendant. Cut 4 inches of brass wire. 2. 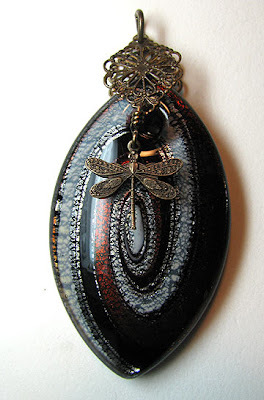 Make a small wrapped loop [LINK] around the loop of the dragonfly charm. 3. 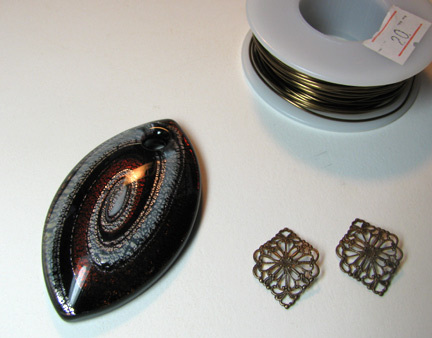 Use a jump ring to attach the two filigree pieces as the top. Thread the wire end through the first filigree piece, the pendant hole, and through the second filigree piece. 4. Wrap a tight spiral on the back of the pendant with the brass wire. 5. 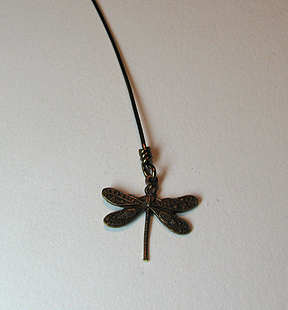 Bend the wrapped loop down gently so the dragonfly hangs correctly. 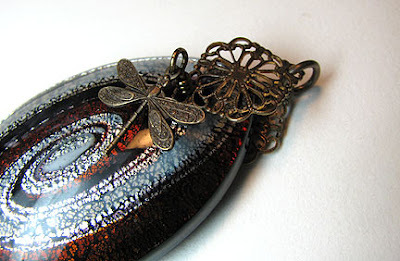 As regards FTC disclosure guidelines: I have received the glass pendant free of charge from Auntie's Beads in order to create a project free of charge for you. I have not been paid for my endorsement as it pertains to the products received.